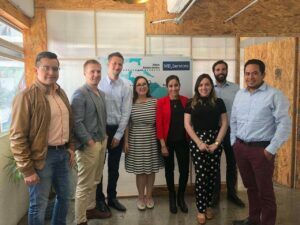 Biz Latin Hub (BLH), the young Latin America market disrupter has united with the Australian Latin America Business Council (ALABC) through a corporate membership. Whilst the BLH company headquarters are located in Bogota, Colombia, and with offices across key Latin America jurisdictions, BLH has always maintained a particularly strong connection with Australia. Co-Founder and CEO, Mr Craig Dempsey is an Australian citizen, has lived in Latin America for 6+ years, but has always maintained a relationship with his homeland. Through a comprehensive knowledge of the LATAM business environment, Mr Dempsey has been able to position BLH as the trusted Latin America partner of Australian companies looking to expand business operations into the region. Some notable Australian clients, both private and public (ASX) of BLH include Nexpay, Sedgman, Laconica Resources, MHM Metals, Minera Gold, Loyal King International, Ascot Resources and PolyMath Ventures. Mr Craig Dempsey, former Australian Army Officer, is excited to be active in supporting the ALABC – “We look forward to a close collaboration with the ALABC and to combined support for the growth of business links between the regions. Seeing the Australian community actively involved in Latin America on a variety of fronts makes me proud and excited – the future looks bright for both regions“. The BLH group are excited to be working alongside ALABC and are keen to strengthen business ties between Latin America and Australia. While traditionally Australian investment in Latin America hasn’t been as large as compared to other regions, in recent times, there has been a steady increase in both FDI, trade, social programs, education etc; highlighting the increasing relations between the regions. The new partnership between BLH and ALABC will strengthen over the coming months and years as they work together to further encourage and promote commercial relations between Australia and Latin America. The ALABC was established in 1989, and today their membership is comprised of leading companies and individuals who are at the forefront of forging business links between Australia and Latin America. The diversity of their membership reflects the growing trade links between Australia and Latin America and guarantees a strong network of experienced entrepreneurs who are committed to developing business in the region. Biz Latin Hub is owned and managed by an experienced team of local and expatriate professionals, dedicated to assisting our clients to navigate their way through the complexities of the Latin American business environment. We are a market leader in helping both local and foreign companies to successfully do business in Latin America, by providing a full suite of multi-lingual Commercial Representation and back-office services. For further information on the Biz Latin Hub Group, get in contact with Co-Founder and CEO, Mr Craig Demspey at [email protected].